The mystére surrounding cloth diapers still amazes me. When Chris and I tell people we have used cloth for more a year now they often remark how gross it must be and that they just don't have the time. Here's the thing: cloth diapering is not difficult, it's not gross and you can't slag it before you try it. Yes, we have to do an additional load of laundry every other day, but it's an easy trade for Eloise's health and the health of our planet. By choosing to cloth diaper we are not contributing to the 27 billion (BILLION!) tons of waste that disposable diapers make up in landfills each year. So what have we learned a year later? Lots. Deciding to cloth diaper Eloise was a great choice and I want everyone to know that they can do it too. Read on to find out what worked for us. We started with a rotation of 18 Kissaluv Kissa's Cotton Fleece Fitted diapers (size 0) and six Bummis Super Brite covers (size small). One cover lasts until it gets soiled so you can reuse it a few times before reaching for a new one. This combo was unbeatable for containing messes we didn't experience one dreaded newborn 'blowout' or any other leakage, even with a round the clock newborn poop machine. When your diapers get streaky (trust me, it'll happen), an afternoon in the sun will take out even major stains and removes odours too. For reals. When Eloise got a bit bigger we added six AMP Stay-Dry All-in-Ones (size small) to our rotation which were easy to pack for outings and trimmer under clothing too. We also switched to medium Super Brite covers and continued to use the same size 0 Kissa's until around six months. Once Eloise reached around 10 pounds, we added pocket diapers into our stash. We have around 30 and our favourites are bumGenius 4.0 One Size and Blueberry Diapers One Size for both fit and durability. 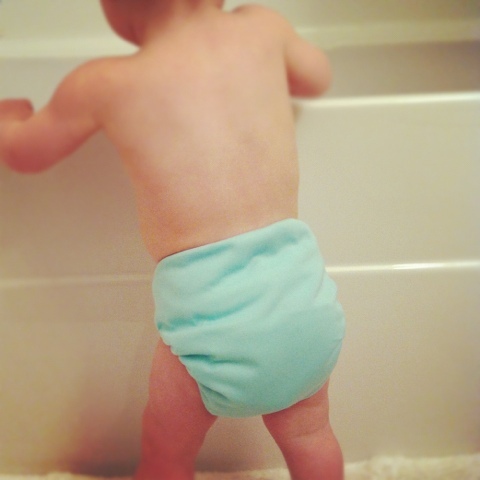 We like pocket diapers with a hook/loop (aka velcro) closure and love, love, love Blueberry Diaper's bamboo inserts which are trim yet amazingly absorbent and our go to for night or long car rides. Eloise is a skinny baby and we've used gDiapers, FuzziBunz, and Baby Kangas as well but struggled to get a good fit. We have nine AMP Stay-Dry All-in-Ones (now in size medium) and enjoy how little room they take up in our always overflowing diaper bag. Speaking of night, now that Eloise sleeps through the night we swear by wool diaper soakers from Babyology to keep her dry until morning. Wool is super absorbent and naturally antibacterial so it's the perfect solution for heavy wetters and we can't put Eloise to bed without her soaker. Solid food also brought on new challenges to diaper 'clean up' and we are huge fans of Bummis Bio-Soft Liners. These awesome, flushable liners allow you to remove solids and they provide a barrier to protect diapers from cream which we always need when Eloise is teething. We currently have about 40 diapers in rotation and wash diapers every two days. We use Country Save detergent to wash and the wash routine is as follows: dump diapers and wet bag into the washer, rinse cold, wash in hot water with 1/8th of a scoop of soap, rinse with hot water and rinse a final time with hot water. This routine does take a good deal of water but I was finding one hot rinse was not enough to get all the soap residue out of the diapers. Once and a while I add 1/4 cup of vinegar to the first hot rinse which helps to eliminate odours and reduce build up. I put liners and all-in-one diapers in the dryer and hang the rest to dry, in the sun if possible (ha ha). Our pail is a simple plastic garbage can with a tight fitting lid and we have two diaper pail liners (or wet bags). We have found Bummis Fabulous Wet Bag to be better quality than other pail liners and I like the zip closure too. We have two wet bags to pack in the diaper bag (one to use, one to wash) and enjoy the fun patterns available from Itzy Ritzy. At home we use Kissaluv Awesome Terry Knit Wipes and keep them at the ready in a Prince Lionheart Warmies Wipes Warmer. The wipes warmer was one of those items that seemed extravagant at the time but has become my number one 'must have' for cloth diapering. It is always stocked with moist wipes so we have a warm, clean cloth at the ready when needed. Cloth wipes do a WAY better clean up job in much less time than disposable wipes and just get tossed in the wash along with your diapers. Next up? It's potty time.